"For ads associated with products in Google Base, a plusbox can be expanded to display relevant products from that advertiser. The plusbox provides users with more information about an advertiser's offering, even before clicking on the ad, and offers advertisers a new way to engage potential customers." Since its inception in 2007, the concept has grown and now includes two different ad formats, and does not require much to get started. The thing I find hard to believe is that many stores are not taking advantage of this unique opportunity, most likely because they never knew it existed, or because they do not know how to make it work. On Google's end, they say these new features will help retailers gain more clicks, higher quality clicks, and higher ROI. Early tests show that these claims seem to hold true. In this article, I'll show you what is needed to take advantage of the current format options provided through the various Google search channels, but first, let me bring everything up to date.
" Product listing ads are a stand-alone shopping ad format that uses product information from the advertiser's Google Merchant Center account. These ads appear in a variety of formats and feature relevant product information, such as the image, price, or name. They can also include an optional promotional message managed in your AdWords account. 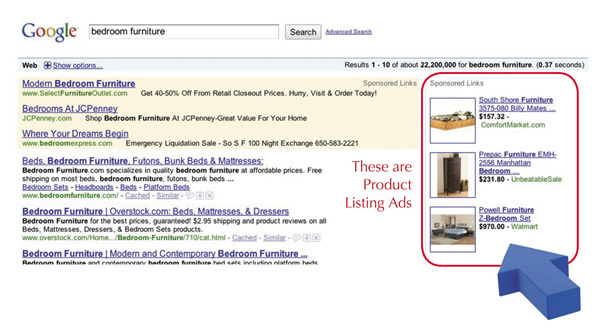 Product listing ads focus on targeting product information to users, and are not designed to focus solely on merchants. For example, ads from competing advertisers may appear together in cases where multiple merchants are selling the same product. Product extensions are an ad format in which product information accompanies a standard text ad with standard keyword targeting. They also use product details from a merchant's Google Merchant Center account, and feature multiple products from only that merchant. Product information appears next to the text ad, which allows users to get a better sense of the advertiser's product selection prior to clicking through to go to the advertiser's site. Together, the extension and listing ad formats provide a single product ad offering in AdWords, both using product information from the same Google Merchant Center account that's linked to your campaign." In short, Google Product Extensions (the plusbox) works just like it did in its early days. Searchers have the ability to see product images and title text under your AdWords ad, which they achieve by clicking on a + sign found next to the ad. The advertiser is not charged for this initial click, but if after clicking that plus sign the searcher decides to click on any of the information they find within the expanded results, the advertiser is then charged for the click as part of the typical Adwords CPC model. "Product extensions allow you to use your existing Google Merchant Center account to highlight your products directly in your Google.com search ads (and Google Images ads when opted into the Search Network). Product extensions will not appear on other Search Network sites, or on Display Network sites. When your AdWords ad appears and your Google Merchant Center account contains a product that is relevant to the searcher's query, product extensions may show the images, titles, and prices of your closest matching products with your ad. Your product offerings may be shown in a "plusbox" ad. When a user clicks a product image, they will be taken to the destination page listed for that product in your Merchant Center account." Product Listing Ads are designed to take advantage of either a CPC, meaning the advertiser pays when a visitor clicks their ad, or CPA model, when the advertiser pays only when the click results in an actual sale on their site. However, at the moment, only a select few larger advertisers are offered the opportunity to give the CPA model a try. Product listing ads currently appear in the right hand search column and do not include the opportunity for expanded information via a + sign. What you see is what you get, yet the setup can be controlled to some degree by what you feed Google. Google offers this additional information on Product Listing Ads. "Product Listing Ads are search ads that include richer product information, including product image, price, and merchant name, without requiring keywords or ad text. Whenever a user enters a search query relevant to an item in your Google Merchant Center account, Google may automatically show the most relevant products, along with the associated image, price and product name." 1) A Google Merchant Center account. 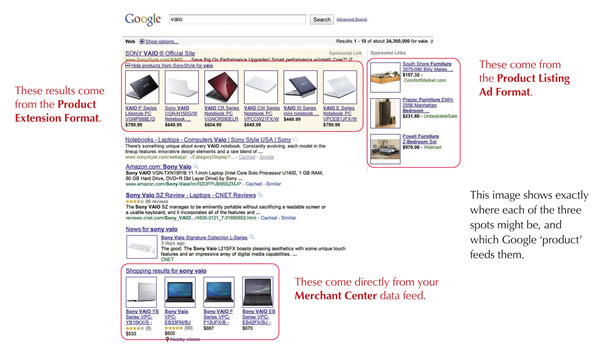 3) Your Adwords account linked to your Merchant Center account. 4) Your Merchant Account linked to your Adwords account. 5) A product data feed, fed into your Merchant Center account. Keep in mind that you can add multiple AdWords accounts to a single Google Merchant Center account by following this same process for each account you want to link. When doing this, be sure to link accounts in both the Merchant Center and AdWords interfaces to complete the process, as linking on one side only will not work. 1) In your Merchant Center account, click Settings, then AdWords. 2) Enter your AdWords Customer ID and click Add. After linking your Merchant Center account to your AdWords account, you must link your Adwords account (from the Adwords side) to your Merchant Center account. The following instructions will show you how to do that. 1) Under Ad extensions > Products, check the box next to "Extend my ads with relevant product details from Google Merchant Center." 2) Select the Google Merchant Center account you'd like to associate with your campaign. Your Merchant Center account must be linked to your Analytics account for this to appear. It can take up to 12 hours from the time you update your settings for your product extensions to appear in your ads. If you are creating a new Merchant Center account, be aware that you may only register one domain with the account. If you would like additional domains registered with the Merchant Center, you must create a new Merchant Center account for each separate domain. We've talked about the two ad formats offered by Google here, but did you know that implementation of this outlined information gives you the opportunity to gain potential exposure for your products in three different locations found within Google search? The key is the Merchant Center account. With that, and the proper linking demonstrated above, you get three chances for exposure. The triple-pronged exposure comes from the Product Listing Ads, the Product Extensions, and the direct feed from the Merchant Center account (i.e. 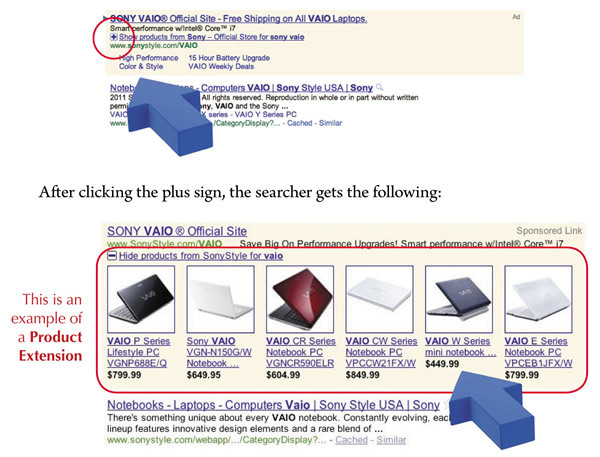 Google Product Search results integrated into natural search listings). The opportunity presented by taking advantage of this Google offering is just too good to pass up. If you have not taken the time to fully integrate your products into Google search, now is the time to do it. The opportunity is completely free, and the results from those using it currently are good, but you cannot capitalize on it if you do not try it. Eric Leuenberger is an ecommerce conversion marketing expert and author of a leading Ecommerce blog at www.TheEcommerceExpert.com. He coaches store owners using his online coaching system, http://www.EcommerceAmplifier.com, teaching how to increase website sales using his proven six step process. He can be contacted at 1-866-602-2673.